In any case, my copy of Ex Libris Miskatonici just arrived, in pristine condition, to my amazement. It cost me $37, including postage to an address in the States, which is a little more than the original price of the book, but a damned sight better than $200! 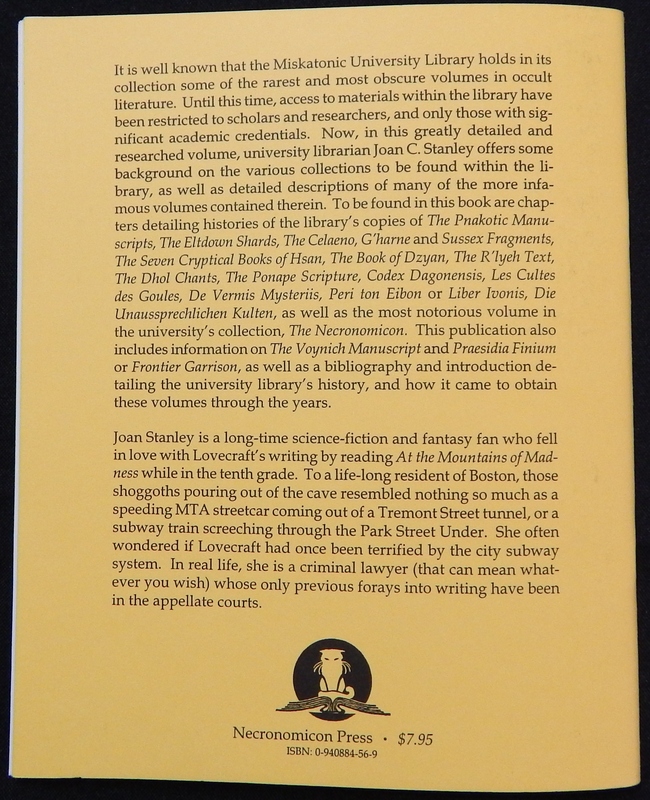 Original Post: A few weeks ago, I ran across a mention of Joan C. Stanley’s Ex Libris Miskatonici: A Catalogue of Selected Items from the Special Collections in the Miskatonic University Library (1993); the person who mentioned it linked a post on the book, over on the blog Deep Cuts in a Lovecraftian Vein. Taken as a whole, Joan C. Stanley’s book is an exceptional example of a small and somewhat obscure form of fiction, one that seeks to mimic creative non-fiction with all the care and attention to detail of a good hoax. This kind of effort to create an “in-universe” document (more or less) is more typically associated with the occult (such as the Simon Necronomicon (1977)) or roleplaying games (such as Le Culte des Goules (2012) by Antoine Téchenet), but it represents the fundamental desire that readers have to interact with the Mythos at a deeper level. Ex Libris Miskatonici is a high-level example of the interaction between fan-fiction and fan-scholarship, showcasing not just the mental gymnastics that some Mythos writers have to go through, but that something positive and worthwhile can result. That was enough to make me want to read the book, though of course the challenges are formidable: it’s been out of print since 1995, and while I’ve seen it claimed on one web forum that Necronomicon Press had print copies for sale at NecronomiCon (the Rhode Island Lovecraft con) as recently as 2014, that publisher hasn’t responded to the email I sent them… and while affordable second-hand copies occasionally do appear on Ebay, the ones there right now are priced at $200 at the lowest, and all the way up to $1900 on one site I saw. Attorney Joan Carol Stanley passed from life on October 16, 2016 after a 50 year battle with rheumatoid arthritis. She attended Boston Public Schools, Howard University, and Northwestern University Law School. She also studied in Japan and France and traveled to many countries. She was a member of the National Honor Society, the Phi Beta Kappa Society, the Star Trek Club, the Boston Philatelic Society and a lover of classical music. After law school she joined Roxbury Defenders and then became the second Black woman in the US to be an Assistant US Attorney. She was also lately criminal defense attorney. Stanley’s approach to the Seven Cryptical Books is synthesis, striving to bring together all the disparate references to the tome which had seen print to that time and grounding the text in actual Chinese language and history. I have no way of knowing whether it influence how she chose to handle the Seven Cryptical Texts, which comprise, after all, the primary East Asian contribution among the fictional books appearing in Lovecraft’s work. That said, it seems at least possible. A young Joan C. Stanley. The second point of note is Stanley wasn’t just a pioneer as a Black female attorney in the American judicial system: she may perhaps also be considered a pioneer as a PoC author publishing a work of Lovecraftian fiction in the 1990s. I have no idea who was the first, but she does seem to be an early figure, at least. It seems odd to me that this detail’s not mentioned in the discussions I’ve seen of Stanley’s book, though it is inunderstandable since it’s not mentioned in her writeup at on the back jacket text, pictured above. Still, it seems like a pertinent detail worth noting and remembering. Ex Libris Miskatonici seems to have been the only book she published. However, web searches reveal that she was also involved in the committee for NecronomiCon as well. And as for my hunt for a copy in print: that continues—maybe I’ll get a response from Necronomicon Press eventually?—though one happy owner of the book was at least kind enough to pass on a set of photos of the contents so I could print it off and read the book. I’m about halfway through, and enjoying it immensely.